Forgotten stage star Florence Mills was one of the first black international superstars of the early 20th century. 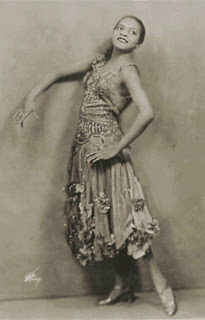 Here, in a beaded and embellished flapper dress, she was the first black woman featured in Vogue magazine. A child prodigy, she took the stage at the age of 4; singing, dancing and acting. Simultaneously conquering Europe with long production runs in Paris and London while helping to usher in the Harlem Renaissance by headlining Broadway shows, her life ended tragically at the age of 31. Wow, I never even heard of Florence Mills and I thought I knew something about the Harlem Renaissance! Florence Mills kind of reminds me of Beyonce they are both great intelligent singing dancers.